Junior midfielder Aidan Cage fights for the ball during Friday's game against Duquesne. Lacrosse will enter its final game of conference play owning the team’s most Atlantic 10 wins in four years – but the team still lies on the cusp of postseason play. The Colonials’ (5–11, 3–5 A-10) 18–8 win against VCU last week earned the team three wins on the season – the most conference wins in four years. GW is now in a three-way tie for sixth in the conference, just within reach of the A-10 Championship. GW could have clinched a spot in the A-10 Championship with a win against Duquesne Friday, but the squad’s loss delayed the team’s hope of making the tournament. Last season, the Colonials jumped out to a 7–1 nonconference record. But once the squad began taking on conference competition, the Colonials stumbled, losing seven of nine games to end the season with a 9–8 overall record. Heading into conference play this year, GW held a 2–6 nonconference record. 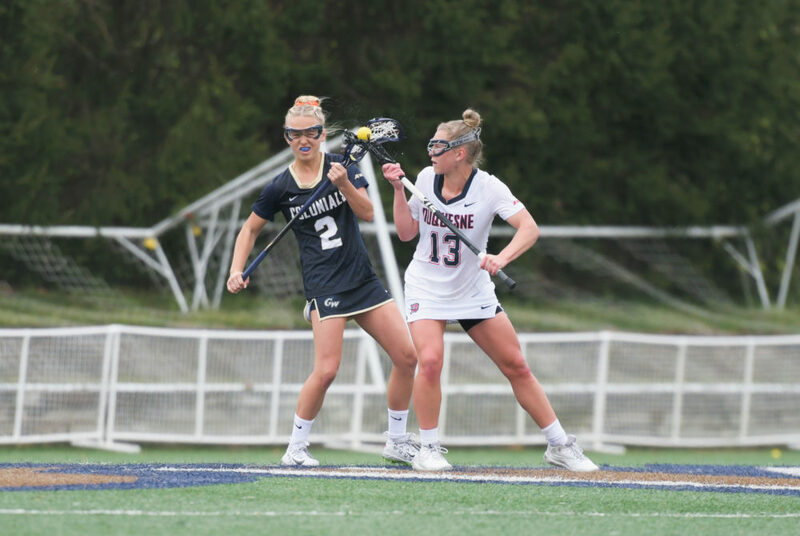 GW rallied after opening A-10 play with a 13–7 loss to La Salle, capturing a close 12–11 win over Davidson and a 16–5 victory over St. Bonaventure. Players said the Colonials’ efficient offense has been key to the team’s success in conference play this year, and the team can spread its scoring wealth among players because players have multiple scoring options at their disposal. The Colonials’ 75.7 shots-on-goal percentage makes GW the fourth-most efficient shooting team in the conference. Junior midfielder Katie Quinn leads the team with 14 goals in conference play and Hampton and junior attacker Morgan McDonnell trail closely behind with 12 and 11 goals, respectively. Cage said the team is doubling down on execution, focus and strategy despite experiencing end-of-season fatigue as GW’s conference schedule comes to a close Saturday. “The mindset is just to take every game one by one when we go out there,” she said. The Colonials have also bolstered their defense and have 249 turnovers this season, the second-lowest mark in conference play. The squad has one more game on deck against Massachusetts – the top-ranked team in the conference – before the season ends. Massachusetts has been perfect in conference play, winning all seven of its A-10 contests. Coyne said the traditionally strong Massachusetts squad appears more “vulnerable” this season as its games have wrapped up with closer scores than in past seasons. The Colonials return to action against Massachusetts Saturday at noon.